The main emphasis throughout the book is word order. It is vital for an English speaking person who wants to learn Punjabi to focus not only on pronunciation and vocabulary but also on learning how to order those new words into a sentence. The explanation of grammar is simple and easy to understand. Each lesson builds on the previous lesson in a logical order and provides practical exercises so that the student can immediately apply what is being taught. PDF eBooks will be emailed within one business day. Paperback books will be shipped free of charge via standard shipping to the United States, Canada, the United Kingdom & Europe. Please see the shipping costs for all other countries at checkout. Orders are shipped from the United States. For non–U.S. orders, allow additional time for customs processing and delivery to areas outside major cities. Please Note: Import duties and taxes may be levied upon delivery. 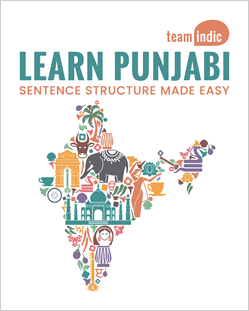 Learn Punjabi: Sentence Structure Made Easy is being used for teaching students of all levels, including elementary, middle, high school and college students. We provide discounts for bulk orders and educators. Please contact us using the phone number or contact form on the contact us page. It is recommended that the student learn the Punjabi alphabet before beginning the course. A set of alphabet flashcards can be downloaded from our site. Although gender and many other aspects of the language are clearly explained, this course is not written for linguists. It focuses on explaining ideas using as few grammatical terms as possible.